We're keeping our eye on a weather system that could spell trouble for the Gulf and oil spill cleanup efforts. A tropical depression has formed in the Caribbean. Forecasters are tracking various models of the storm that show it could move into the Gulf of Mexico early next week. The fear is it will become Tropical Storm Alex or worse - Hurricane Alex - the first named storm of the 2010 Atlantic hurricane season. We'll have the latest on the track of the storm tonight on 360°. Sen. Bill Nelson, D-Florida, is worried that the federal government is not prepared to deal with a tropical storm in the oil area. Nelson is demanding to know that plans are in place to deal with the possibility of a major storm hitting the area. Nelson wrote a letter to National Incident Commander Adm. Thad Allen. "I was told that if a hurricane or major storm passes over the Deepwater Horizon, efforts to capture oil at the site would be shut down for perhaps a week or more," Nelson wrote. This means oil would gush freely into the Gulf until crews could return. You'll hear from Sen. Nelson tonight on the program. Join us for this story and much more starting at 10 p.m. ET. See you then. 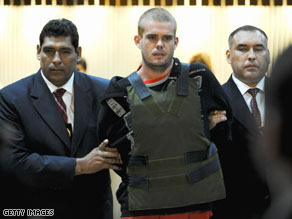 Peruvian police said Thursday they found skin underneath the fingernails of a 21-year-old student Joran van der Sloot is accused of killing. Miguel Canlla Ore, a colonel in the Peruvian National Police and head of homicide, told journalist Victoria Macchi that the amount of skin was small and that laboratory DNA tests that might indicate who it came from had not been completed. Peruvian authorities have charged the 22-year-old Dutchman with murder in the death of Stephany Flores, whose body was found June 2 in a hotel room registered to van der Sloot. He also is the lead suspect in the 2005 disappearance of Alabama teenager Natalee Holloway in Aruba. Van der Sloot was arrested twice in connection with Holloway's disappearance but was never charged because of a lack of evidence. A court document obtained by CNN shows Flores had a cranial fracture and other injuries to her face and neck and showed signs of asphyxiation. Forensic tests in the hotel room where her body was found showed blood on the floors, hallway and mattress, the document said. I spent the week touring the Florida Panhandle talking to people about oil and the fear of oil, both of which are scaring away tourists faster than Ralph Nader in a Speedo. And I have concluded this: There are a lot of Waffle Houses down there. Seriously. Seems like every few miles you see a yellow sign poking into the sky, inviting you to pull over and indulge in a dose of 24-hour cheer and bacon. 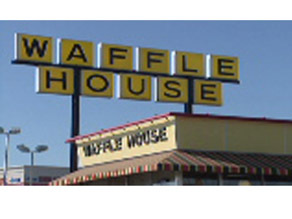 Like Roy McAvoy in “Tin Cup,” I’m a Waffle House fan, which might explain why I was seized with the idea of how they could help that other WH (meaning the White House) take on the myriad problems facing our nation. 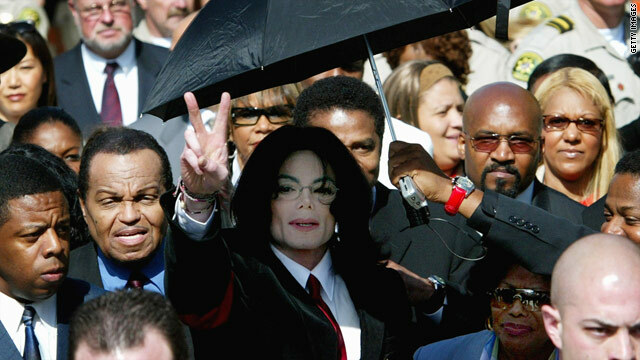 Michael Jackson's death instantly changed the lives of his family and friends. The weeks immediately after the pop icon died were chaotic, and many questions are still unanswered for those closest to Jackson. The day their father died, Prince Michael, 13, Paris, 12, and Blanket, 8, moved in with their grandmother Katherine Jackson at the Encino, California, home where Michael once lived with his family. The home is filled with memories of their father, including many photos of a young Michael Jackson. The theater room of the large house was converted into a classroom where they've been home-schooled for the past year. The grassy yard of the Encino estate is often filled with Michael's kids playing ball with four cousins - the sons of Jackson brothers Jermaine and Randy - who have lived there the past year with their mother. They share a computer with internet access, which resulted in fans getting a rare and candid look at Blanket's dancing, acting and light saber skills when several videos were uploaded to YouTube in April. While Jackson kept his children shrouded in privacy during his life, they have appeared at a handful of public events to honor their father since his death. On paper, it appeared to be a winning team for President Obama and his new plan to fix Afghanistan: a celebrated general, a master of counterinsurgency strategy overseeing the wars in Iraq and Afghanistan as head of CENTCOM, with his his protege running the war in Afghanistan. The two - Gens. 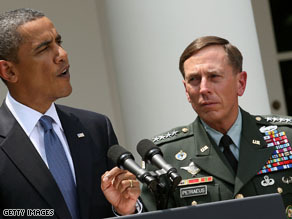 David Petraeus and Stanley McChrystal - had enjoyed success because of their military minds. Ask around the Pentagon, and the phrase most often used in connection with both is "brilliant." While coming from different paths, both generals have a good deal of similarities. After the now-infamous Rolling Stone article, however, it is clear that Petraeus alone has the savvy to survive in Washington. An academic with political deftness, Petraeus approaches combat with a mix of military and diplomacy, the essence of counterinsurgency. Petraeus made his first big mark with a successful air assault in northern Iraq in 2003 and kept the region U.S.-friendly while the rest of the country spiraled into chaos. He then used the counterinsurgency strategy to help bolster the U.S. war effort in Iraq for President George W. Bush. 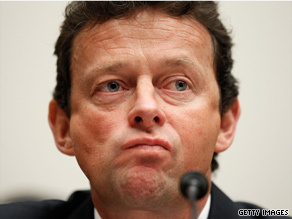 If embattled BP chief executive Tony Hayward leaves the company, he is not likely to walk with a massive windfall, compensation experts said. While his departure is not imminent, speculation is rampant that the oil spill in the Gulf of Mexico will cost Hayward his job. According to a prediction market run by Intrade, there is a 70% chance Hayward will be gone before the year is out. That raises the question of how much severance he could receive if he steps down. BP spokesman David Nicholas would not comment when asked about a possible severance plan, adding that Hayward remains the company's chief executive. But experts say Hayward will probably not get a lucrative package of bonus money and stock awards that many U.S. companies give to outgoing CEOs as so-called golden parachutes. Hayward's salary last year was just over 1 million British pounds, or $1.5 million, according to BP's annual report. He also received a bonus worth more than $3 million and stock valued at nearly $1 million in 2009, the report said. Video: How did Michael Jackson really die?